Shortly after the North Eastern Railway's (NER) electrification of the passenger lines on the north bank of the Tyne (see NER Tyneside Electric Multiple Units), it was decided to also electrify the Newcastle Quayside branch. This line was only about a mile long and connected the Newcastle Quayside to Trafalgar Yard near Manors East Station. This short line descended a semi-circle at between 1:27 and 1:30 through three tunnels, and was particularly difficult for steam locomotives and their crews. Ventilation of the tunnels was particularly bad under certain wind conditions. There were also numerous reports of chimney sparks setting light to packing straw in open wagons. This short line also gave the NER an opportunity to study freight operations powered by electricity. Two "0-4+4-0" (Bo-Bo) electric locomotives (Nos. 1 & 2) were built to operate the branch in 1905. The frames and bodies were constructed by Brush Engineering in Loughborough, who acted as sub-contractors to British Thomson-Houston Co. who supplied the electrical equipment. The track was fitted with a conductor ("third") rail in the tunnels where there was insufficient overhead clearance. It was also used when travelling to/from Heaton shed. For safety reasons, overhead wires were used in the yards at each end of the branch. 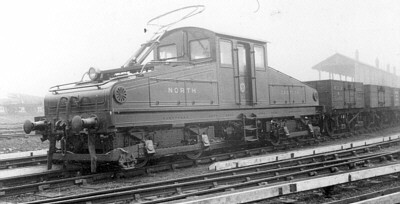 The locomotives had a central cab and sloping bonnets. Electric headlights were mounted on these bonnets. Electrical resistances were located under each bonnet, and these were separated from the cab by thick leather curtains. Overhead pickup was initially from a bow collector, but this was replaced with a pantograph in 1908. Collector shoes were initially mounted on the outer ends of each bogie, but these were moved to the centres of the bogies. This change is thought to have occurred during the late 1930s when new sanding gear was fitted to the outer edges of the bogies. 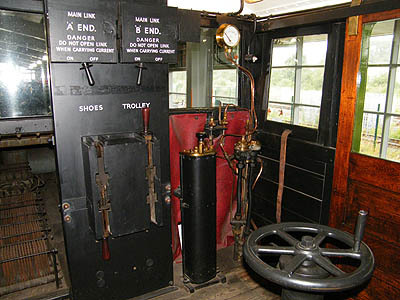 Hand-operated open knife switches selected collector shoes or pantograph as the power source. The switches were in a such a location that it was possible to accidentally lean on them. Eventually they were enclosed in a wooden case with just the operating handles visible. Electrical operations of the Quayside branch began on 5th June 1905, but both locomotives did not enter NER stock until July. Note that some sources incorrectly quote the start of electrical operations to be 1904. The Quayside branch was operated on the principle of "one engine in steam" using a wooden staff. This staff had a brass sheath stamped with the words "NEWCASTLE QUAYSIDE BRANCH". The staff was kept at Argyle Street signal box when not in use. The second locomotive would be kept as a spare, and they were usually switched over on a weekly basis. A Y7 0-4-0T or J72 0-6-0T was usually used to haul wagons from the lower yard to the quayside. This locomotive would be taken down the incline in the morning by electric locomotive, and returned in the evening. Operations were unusual for an incline. The locomotive was always at the upper end of the train, and a special 20 ton brake van fitted with sand gear was at the lower end. At the entrance of the lower yard, the train was stopped and the brake van was detached so that it ran into a siding under gravity. The locomotive could then propel the train into another road, pickup a new train, and then the brake van. A more conventional working with the locomotive at the bottom of the train was not practical due to the location of a tunnel near the mouth of the lower yard. If this working had been used, the brake van (which was controlling the descent of the incline) would have still been in the sharply curved tunnel, when the train was entering the yard. Also, operating wagon brakes in a dark tunnel was particularly dangeous with the proximity of the conductor rail. Nreak-aways were contolled with a set of spring-operated points that would divert the train into a siding known as 'The Runaway'. The locomotives were always manned by two people. This was partly because the change from overhead to third rail pick-up required a certain amount of dexterity. 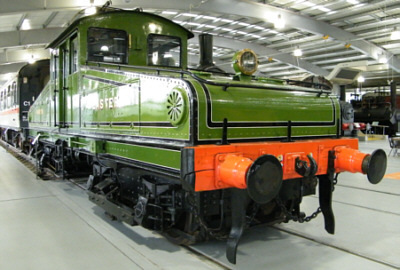 More importantly, the ES1 locomotives were not fitted with "deadman's handles". The controller would remain in the same position when left unattended, and could remain 'on' if a driver was taken ill. Described simply as "0-4+4-0" by both the NER and LNER, these two engines did not have an official classification until 4th October 1945 when they were designated as Class ES1 (Electric Shunting 1). 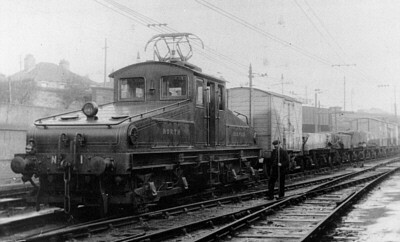 Despite the lack of an official classification, early photographs also show them with the words "CLASS ELECTRIC 1" on their bufferbeams. British Railways (BR) renumbered Nos. 1&2 as Nos. 26500 & 26501. Both locomotives continued to work the Quayside branch until they were replaced by an 0-6-0 diesel on 29th February 1964. The ES1s were put into store at South Gosforth car sheds, and withdrawn from stock in September 1964. No. 26501 was sold for scrap in April 1966. No. 26500 was stored at Rugby before entering preservation in 1968. No. 26500 has been preserved as a part of the National Collection, and is currently at their Shildon Locomotion location. Judith Edge Kits sell an etched brass kit of the ES1 for OO gauge, and an etched brass body kit for 2mm scale. ETS produce an O gauge model of the ES1. Thank you to Kyle Nicholas and Bill Donald for the above information. Thank you to Bill Donald for supplying the above black and white pictures of the ES1 locomotives at work from the Bill Donald Collection. Thank you also to Robert Langham for the photograph of No. 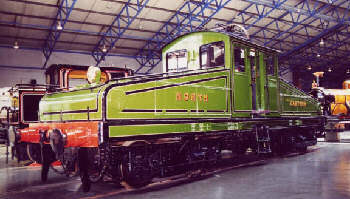 2 in LNER livery, and the photographs of the preserved ES1 Bo-Bo.